Myofascial Therapies cover a range of hands on treatment to strengthen and stretch muscles , tendons and fascia tissue. They include massage, joint mobilizations, stretches and a range of other direct hands on techniques. 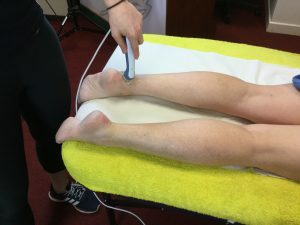 Ultrasound Therapy is commonly used with bruises or contusions and tendonosis to promote blood flow in damaged tissue where mayofascial techniques would be too severe on the injured tissue. It is very useful for speeding up recovery from dead legs or the likes of Achilles tendonitis. 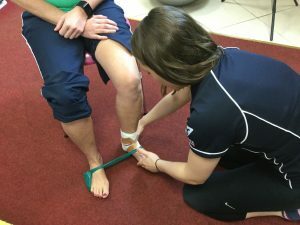 Rehabilitation Techniques come into play in the later stages of injury recovery when the damaged tissue is strong enough to begin to do its job again. The rehabilitation techniques will help strengthen the recovering tissue and return it to its normal function. Proper Rehabilitation is crucial to preventing return of the injury. 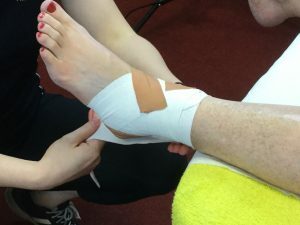 Tapings and Strappings can be of great assistance in injury recovery, we offer a full taping service to assist with joint stability, swelling and Kinesio Taping to help with muscle re-education.